Choosing the right light fixture for a kitchen island is an important step in your kitchen design. You want something beautiful and functional, right? So here are my tips for creating a perfect combination of island size, ceiling height, and pendant size. Pendant Size: 13 1/2" wide by 21 1/2" high (to the top of were the 3 chains meet). The family uses this island table as the main eating area. (So we needed something especially beautiful, since they would spend so much time there!) We chose this lighting fixture because it's so unique and adds a focal point to the room. We didn't use pendants over the other island in the kitchen that serves as a work space with a sink because we didn't want anything to compete with these lights. Aren't they gorgeous? Because the ceiling is 10 feet high, we could get away with a more dramatic presentation. (Hooray for drama!) 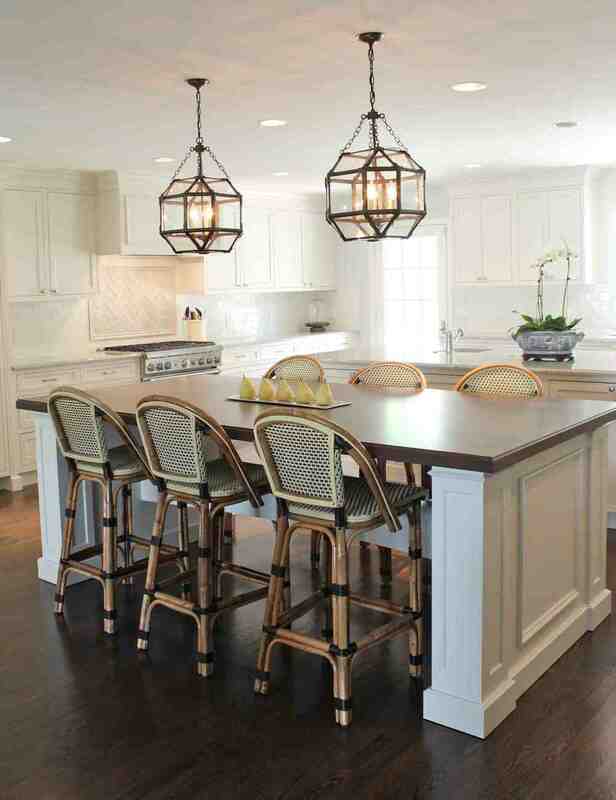 We chose three light fixtures to create a presence over the island. Do you love it?